Mini Me Geology Blog » Do You Have a Sandstone or a Quartzite? Do You Have a Sandstone or a Quartzite? Quartzites are metamorphic rocks that were once quartz sandstones. 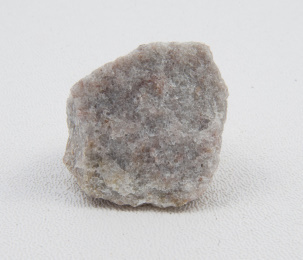 The quartz sandstones change to quartzite from high heat and pressure deep inside the Earth. Sometimes quartzite rocks have the same, bedded look as the original sandstone, making the two hard to tell apart. In quartzite, the sand grains are interlocking but in sandstone, they are simply stuck together. So how do you tell them apart? Interestingly, there is one way to tell these rocks apart and it is fun to do! Wrap the rocks in a towel and place them on a sturdy table or on the floor. Break each rock sample using a rock hammer. Even though you wrap the rocks, you should wear safety glasses during the experiment. Use a hand magnifier to examine each rock along the breaks made with the hammer. The sandstone will break around the quartz sand grains so you will be able to see individual, whole grains. The quartzite will fracture through the quartz sand grains so you will not see individual, whole grains. We have a wonderful selection of sandstones and quartzites for your collections and projects.